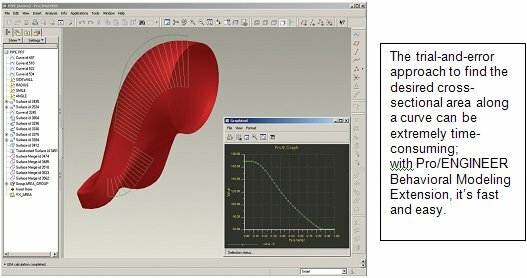 Wouldn’t it be great if your computer-aided design software automatically determined the best design for you? Think of the time and effort you’d save. That’s exactly what Pro/ENGINEER Behavioral Modeling Extension (BMX) does for you, by delivering three key capabilities: design studies, smart models, and an open environment that uses calculated results from external programs. 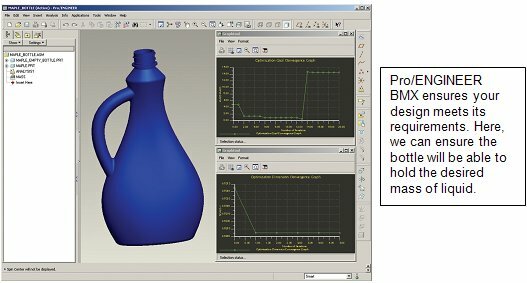 When you have multiple design objectives to consider, such as how to maintain product strength while reducing material wall thickness, it can be very tedious and time-consuming to manually calculate the optimum values. Even then you can’t be sure that you have the optimum design, because it simply takes too much time to calculate all of the various possibilities that might work. Pro/ENGINEER BMX automates this process for you, using design studies. To conduct a design study, you simply define your engineering goals, then define where your design is flexible, and Pro/ENGINEER BMX automatically analyzes countless iterations before arriving at the best solution. Pro/ENGINEER BMX raises the level of design automation from simple geometry creation to a fully engineered solution. All you need to do is simply pick the best design and move on to your next task. Pro/ENGINEER BMX can also optimize specific features within a design by creating “smart models.” Smart models capture design and process information, so that the model has the built-in intelligence to actually understand its function. Pro/ENGINEER captures this knowledge as a feature, which is automatically evaluated against the requirements–as the design evolves. This automation will increase your level of confidence that the design will function as intended–the first time. It also means that engineers can focus their energy on developing the design rather than continually checking engineering requirements. Pro/ENGINEER BMX saves you time and effort in many ways. For instance, very often you need to use complex formulas to calculate design variables. And, usually, these calculations require third-party tools. Just imagine if your design software automatically read the output from those third-party programs and automatically updated your design? Not only would this save you time, but it would also eliminate the need to manually input values, thereby reducing the risk of errors. With Pro/ENGINEER BMX, this is more than possible–it’s easy! Only Pro/ENGINEER BMX features an open, extensible environment that enables organizations to integrate diverse external tools into their design process. When defining Simplified Representations of large assemblies in Pro/ENGINEER, a user needs to either be very familiar with the part names and structure of an assembly or needs to bring into session the Master Rep or a rep with more detail that the engineer might normally not want to take the time to regenerate. They also need to take into consideration the amount of data they want to have uploaded to the Workspace as well as the time it takes to clean out Workspaces to remove unnecessary data. 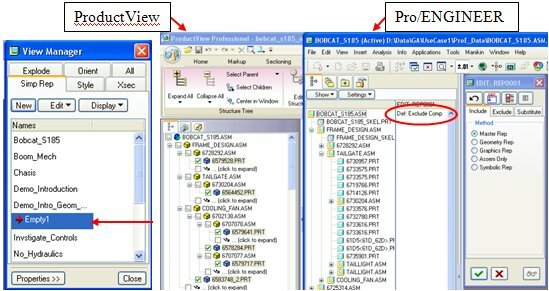 How can the user easily browse a Pro/ENGINEER assembly to identify the components to include in a particular representation? Let’s take a look at ProductView MCAD Professional. 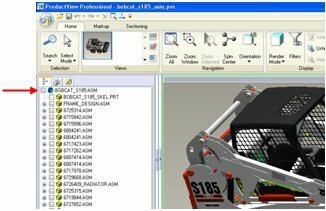 An assembly can be opened in ProductView quickly due to the reduced file size. An assembly can be opened in ProductView directly from the object’s Detail page in Windchill without being downloaded to the Workspace. ProductView visualization files can be created automatically, when an object is checked into Windchill. Multi-select from structure or on model by holding down the control key and selecting with the left mouse button. 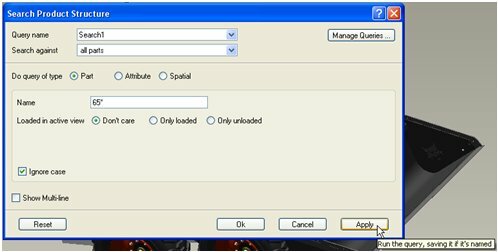 The user is presented with the option of 3 types: Part, Attribute and Spatial. Select the Part option and browse down to Name block. Enter a name or a partial name using * as a wildcard and then select Apply. Go to the Product Structure, highlight the top level assembly, hold down the right mouse button, select Collapse and then choose Selected Parts to 1 Level. Select in the box next to the top level assembly to Unload All. In the Search Results, hold down the right mouse button and choose Select All. Hold down the right mouse button again and choose Select in Product Structure. 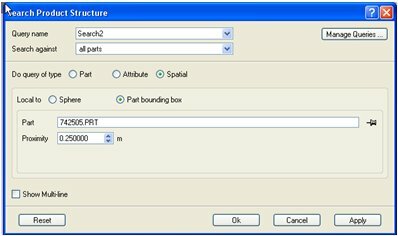 On the Search window set the type as Spatial and then choose either Sphere or Part Bounding Box. If using sphere, use the Pin icon to locate the center of your search and enter a Radius value to define the extents of the search. If using Bounding Box, select the part of interest and set a Proximity value. Select Apply to run the search. Once the user has identified the parts of interest for the Simplified Rep, go to the circular icon in the top left corner of the window and choose Save Annotation Set As. Enter a Name for the annotation as well as the Author and Comments. OK to finish. Go to the Annotation Sets tab to the right of the Structure tab to see a list of annotations and double click to open the one of interest. Repeat for each Simplified Rep the user would like to create. Go to the Filter bar at the bottom of the Structure tree, click on the bar with the left mouse button and on the dialog box which appears, check the Only Selected Parts option. Open a session of Pro/E and open your assembly using the By Rep option. Choose a Simp Rep which contains zero components or create an empty rep on-the-fly from Simp Rep dialog box. Open the View Manager, select the Simp Rep tab. Create a New Simp Rep, enter a name and set the Default Mode to Exclude. Select the Include tab and use the Model Tree to select components/subassemblies. 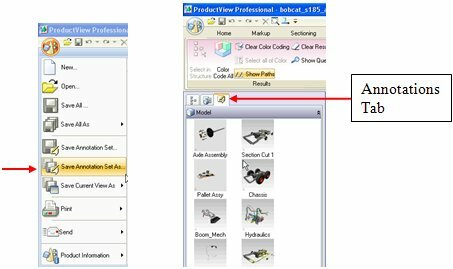 Compare Model Tree in Pro/E with Structure in PV to manually select parts/assemblies to be included in new Simp Rep.
Have your ProductView window set up so that the Product Structure is on left edge of the screen, have Pro/E on top and set the left edge of window so the ProductView Product Structure is visible. The PTC/USER Portal is getting an updated, fresh user interface. The functionality is remaining the same but the site is being redesigned to allow for easier navigation by users. You will also begin to see blog articles being posted by the PTC/USER Board of Directors highlighting different aspects of your community and other relevant info. For more details on these changes you can read about them in the What's New guide. Enjoy the redesigned site and we look forward to your feedback. Did you miss an issue? Can’t find that awesome technique you read about? Fear not, you can click on the link below and go through our Customer PTC E-Newsletter archives. PTC Tips & Techniques Webcasts: Work Smarter. Not Harder. Click below to see regularly scheduled Tips & Techniques technical Webcasts that are designed to provide you with the most popular time-saving tricks that Pro/ENGINEER users of all skill levels will find useful. Get more out of your maintenance dollars! Tips & Techniques: Work Smarter Not Harder! Explore what is new with the Pro/ENGINEER Wildfire family! Our seminars and conferences seek to provide you with relevant information regarding product development trends in your industry as well as innovative software learning experiences. Think of them as a constructive day off where you can share experiences and swap ideas with your peers. If you can't manage to get away, we'll bring it to you. Check back often for regularly scheduled live webcast events. Please visit the PTC Education Services website for the latest training information including course descriptions, schedules, locations, and pricing. Attend a course at any PTC Center and receive a free copy of Pro/ENGINEER Wildfire Student Edition! Virtual Classrooms provide interactive learning with a trained PTC instructor in convenient and manageable sessions that last approximately 4 hours over a series of days. It's easy to join a class right from your desk using a phone or voice-over IP technology. Sessions are performed just like a traditional ILT (including interactive exercises where you and the instructor can work on lab exercises together) and feature some of our most popular ILT courses. These sessions cover the exact same material as the traditional ILT in-center courses. Also look for some of our most frequently requested mini-topics delivered in the same format that are only an hour - two hours in duration. If you have any questions about these sessions or would like to see getting other courses, not on this list, on the schedule please feel free to contact me for more details. They are a great way to bring training to you without you having to worry about location or being out from work for long stretches. you can go to PTC University directly at http://www.ptc.com/learning and submit a registration request directly. All you have to do is search the catalog by typing in “virtual” in the search field and you will see a listing. Note: These newsletters are compiled in the local PTC office and are delivered via PlanetPTC Community.